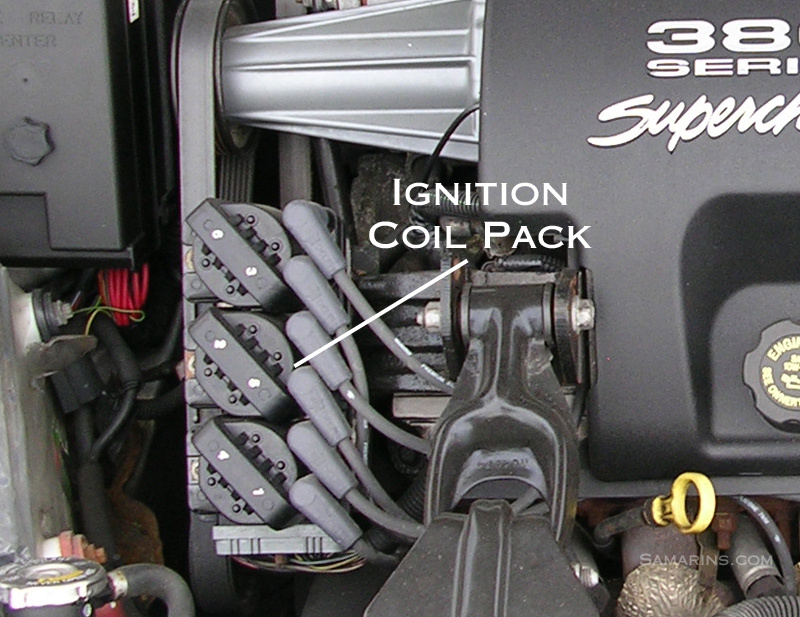 An ignition coil is a part of the vehicle's ignition system. It converts 12V battery power into high voltage in order to create a spark at a spark plug. The spark ignites the air/fuel mixture in the engine cylinders. Most of the modern cars have one ignition coil per cylinder. Often, an ignition coil is installed right over the spark plug, like in this Ford engine in the photo. This setup is called coil-on-plug. In some cars, ignition coils for all cylinders are combined into one coil pack. 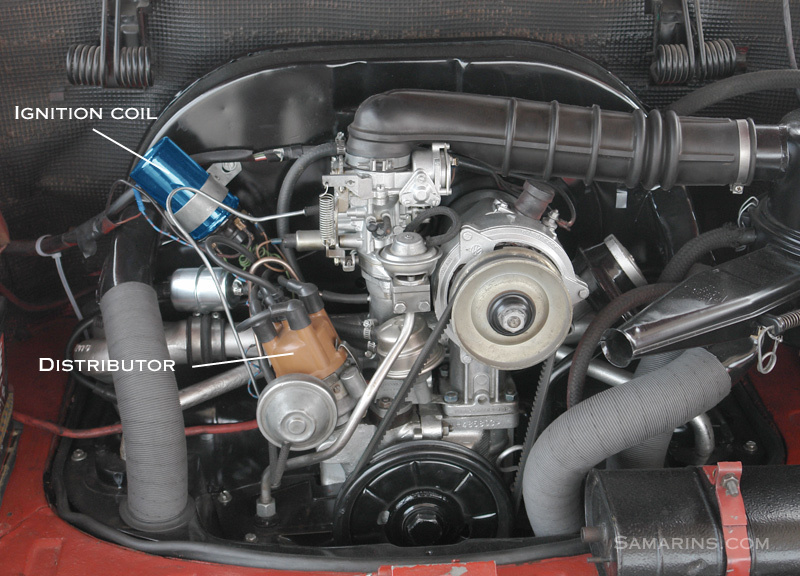 In older cars with a distributor, a single coil is used for all cylinders. See this example of a single ignition coil in a Volkswagen air-cooled engine. 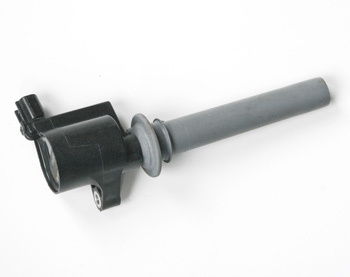 Ignition coils are common to fail in many cars. Symptoms of a bad ignition coil include engine shaking, sputtering and lack of power (misfiring). The Check Engine light will flash repeatedly or stay on solid on the dash. In cars with a single ignition coil or coil pack, a bad coil (or coil pack) will cause the engine not to start. Often, ignition coils fail after water has gotten into the engine bay. 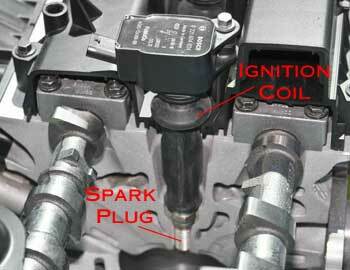 Ignition coils are more likely to fail if spark plugs haven't been replaced for a long time. This is because an old spark plug has a larger gap and higher resistance, which adds strain on the ignition coil. In some cars, driving with a failed ignition coil can damage a catalytic converter or even the engine computer (PCM). An ignition coil produces extremely high voltage that is dangerous for your health. Whenever working with ignition components, follow safety precaution found in the service manual for your car. We posted several links where you can get a subscription-based access to a factory service manual in this article. The first step when inspecting or replacing an ignition coil is to disconnect the negative battery cable. First, your mechanic will scan the engine computer for trouble codes. The trouble code may point out which cylinder misfired or even which coil has failed. For example, the code P0301 means that the cylinder number one misfires. The code P0351 reads Ignition Coil "A" Circuit Primary/Secondary Malfunction (cylinder 1). After that, an ignition coil must be inspected following the service manual procedure. We posted several links where you can get subscription-based access to a service manual at the bottom of this post. Usually, an ignition coil inspection includes measuring the resistance between specific ignition coil terminals. If the resistance is outside of specifications, the ignition coil must be replaced. Sometimes to identify a failing ignition coil, mechanics may try swapping a suspected coil with a known good one from a different cylinder, to see if the misfiring moves with the coil or stays at the same cylinder. For example, with the code P0302 (cylinder 2 misfire) a mechanic may swap the cylinder 2 and cylinder 3 ignition coils and run the engine for a short time. If the trouble code changes from P0302 to P0303 (cylinder 3 misfire), the ignition coil that was originally at the cylinder number 2 is bad. Ignition coils are also recommended to be replaced if they show cracks, traces of arcing or other damage that may cause it to short out. A faulty ignition coil cannot be repaired; it must be replaced. In most cars with a 4-cylinder or inline-6 engine, replacing an ignition coil is a simple and not very expensive job ($180-$380 for one coil). In some V6 engines, to gain access to rear ignition coils, an intake manifold must be removed (e.g. Ford Edge, Ford Escape V6, Nissan Murano, Toyota Camry V6). This involves more labor and costs more ($280-$500 for one rear coil). In cases like this, to prevent future problems, your mechanic may recommend replacing all three rear ignition coils. Whenever one of the ignition coils goes bad, it's also recommended replacing all spark plugs if they haven't been replaced in a while. New spark plugs will help ignition coils last longer.